They are deeply rooted in African funk music by the likes of Fela Kuti or Hugh Masekela, but as well influenced by american soul, funk and jazz of the sixties and seventies. Out of these influences they forge their own unique sound, that can't be found anywhere else. Singer Zsolt Tokaj wrote this heavy grooving and also beautiful song called "Bubbles". The original studio take lasts for more than 7 minutes, so we had to cut it for the 45 rpm release into two parts. Listen to the strong horn-lines of the five (!) horn-players, the tight rhythm section and the amazing vocals of Zsolt in Part One. Part Two kicks off with an amazing breakbeat intro, exposing the skills of the percussion players, until it comes to the grand finale. DJs will love it, especially the b-side with that monster drum/percussion break half through the song, just perfect for the dancefloor! If you dig Antibalas or the Timmion crew out of Finland, you will be pleased with this release. Definitely a very exciting mixture of styles which has the world not seen yet. 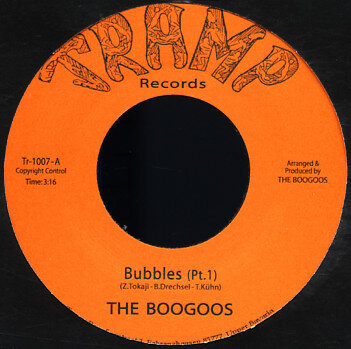 The Boogoos includes members of the original Poets of Rhythm, The Hi-Fly Orchestra and The Express Brass Band. All those bands have released several LPs/CDs in the field of funk, latin, brazil and traditional new orleans-jazz over the last 10 years. A tasty little cooker from the always-trusted Tramp label -- a cut that begins with fierce, full-on horns -- then rolls into a tight-riffing groove topped with some especially great vocals! The sound's a bit like the JBs -- with super-fast vamping that works wonderfully with the horns -- but it's a bit different too, especially given the oddly fluid sound of the singer! He's got a different quality than usual for a deep funk vocalist -- and really makes the single sound great.